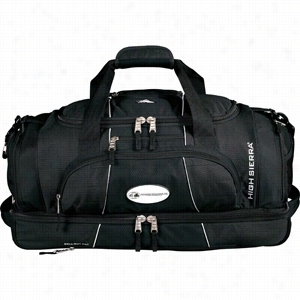 High Sierra Colossus 26" Drop Bottom Duffel. The Colossus has a large lined interior that is easy to clean. Two zippered lined compartments roll up when not in use (one features grommets for ventilation). Zippered front accessory pocket. Elastic mesh side pocket with Velcro closure. Water bottle pocket and D-ring hook on end. Pocket for portable music player with headphone port. Drop pocket for items such as Sport goggles and Sunglasses. Hidden backpack straps with Vapelâ„¢ mesh padding are stored behind bottom panel. Detachable, adjustable shoulder strap with Vapelâ„¢ mesh padding and suspension system. Neoprene handle wrap wicks away hand moisture. Vapelâ„¢ mesh grab handles on each end. Includes lifetime warranty.Note: Instructions Included: No Materials: 600d PolyCanvas and Ripstop Nylon Manufactured By Leeds. Emergency Battery & Retractable Earbuds Set. Combines the Tough Tech Accessory Case with the Ultra-Slim Mobile Charger and the PL-3534 Easy-Retract Earbuds.The Accessory case is made from rigid EVA plastic with a 1680d polyester cover and features an internal elastic mesh pocket and elastic strap with dual-zippered closure with contrasting piping.The mobile charger is a portable Lithium-polymer battery in ABS plastic and stainless steel shell allows you to charge your devices virtually anywhere and includes standard USB connector cable to charge battery from your computer or any USB port with a power supply, features progress indicator bar. Input: 5V DC; Capacity: 4000mA; Output: 1A ; Lifespan: Up to 500 charges. Charging capacity: 100% for iPhoneÂ® & Smartphones; iPadÂ®: 100% for iPadÂ® 1, 2 and 3 - 100% for iPadÂ® Mini; 100% for iPodÂ® and Digital Music Players . CE and FCC approved.The earbuds retract with the touch of a button and include a 3.5mm plug .The mobile charger in this set is IEC 62133 CB Certified by UL Underwriters Laboratory. High Sierra Grizzly Outdoor NFC Bluetooth Speaker. Enjoy your favorite music regardless of your location. 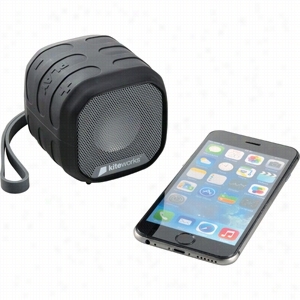 The High SierraÂ® Grizzly Outdoor NFC Bluetooth Speaker is water resistant (IP-65 rating), dust resistant, impact resistant and provides hand's-free calling with the microphone. Perfect for hiking, camping, backyard use or any outdoor adventures, even on rainy days. The stylish design is suitable for desktop use as well. The Grizzly provides up to 6 hours of playback time via Bluetooth. It can also serve as speakerphone which allows you to conference call. The built-in NFC Technology allows you to simply connet the speaker to some headsets that are NFC compatible from manufactures like Samsung, Nokia,sony and others. Includes USB to Micro USB charging cable with 3.5mm splitter audio cable and a hand strap. Material: ABS Plastic. Manufactured By Leeds. ifidelity Mixmaster Bluetooth Pairing Speakers. Listen to enhanced sound with this high-quality Speaker system. 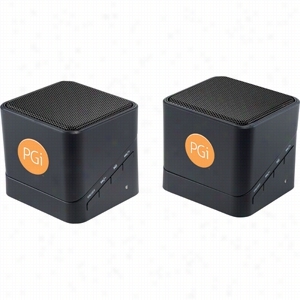 Stream your music or favorite movie to two separate speakers at the same time. Don't let the small size fool you as these speakers produce quality sound. Plus the small sizes makes them easy to store and perfect for travel, the office, or home.Â Bluetooth technology provides quality streaming audio with a cordless design. Includes a 3.5mm audio cable and USB to Micro USB charging cable. Bluetooth working range is 10 meters (33 feet). Material: ABS Plastic. Manufactured By Leeds. Music for Three, Collection #9 - La Musica de Mexico. 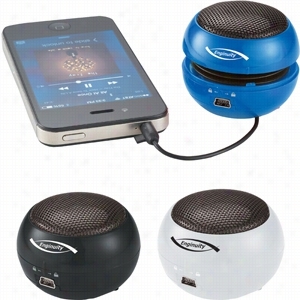 Listen to music anywhere with this expanding travel Speaker.Includes an integrated 3.5mm jack so that you can easily connect to your music source.Includes charging cable.Media device not included.Material: ABS Plastic. 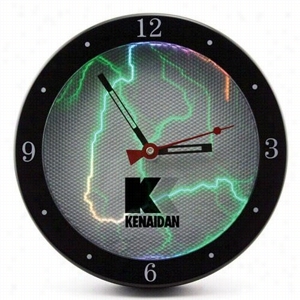 9" Sound-Activated Plasma Wall Clock. This sound-activated clock will grab the attention of your customers and make your promotional message virtually impossible to ignore. Its rainbow-colored Electrical pulsations will flash in sync with music or the sound of your own voice. The intensity of the effect mirrors the loudness of the sound. The plasma feature can also be set to run continuously or turned off to save power. The analog clock, with hour, minute, and sweep second hand, features a high quality quartz movement and your logo printed on the clock face cover. Made of sturdy plastic, the clock has a fold-out metal easel stand for desktop use, or you can hang it on the wall with the recessed hanging notches on the back. The clock operates on 1 AA battery (not included). The plasma display can be powered by 4 AA batteries (not included), or an included AC adapter. Tuscany Tech Case & Power Charging Essentials. Includes the Tuscanyâ„¢ Tech Case with the Round USB Car Charger and the Power Charger Plus. Case is soft faux leather over rigid EVA plastic shell with two internal elastic mesh pockets, large pocket with Velcro closure and zippered closure. The charger has dual ports and a LED ring that helps illuminate the logo area in the dark. Input: DC12V-24V; Output: DC 5.0V-1000mA, 2.1-1A. White USB port is for all apple Products such as iPodÂ®, iPhoneÂ®, iPadÂ®; Black USB port is for SamsungÂ®, HTC, BlackberryÂ®, smartphones, tablets, etc. U.S. Patent No. ZL 201230063356.1. Battery is a portable Samsung Lithium-ion cell in ABS plastic shell allows you to charge your devices virtually anywhere. 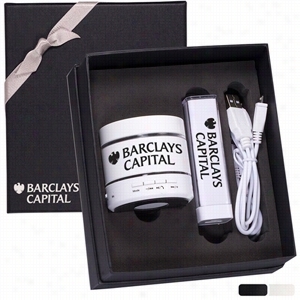 Power bank includes standard USB connector cable to charge battery from your computer or any USB port with a power supply. Features lighted ring on end and charging lights on body. Input: 5V DC/1A; Capacity: 2600mAh; Output: 5V DC/1A. Lifespan: Up to 500 charges. Charging capacity: 100% for iPhoneÂ® & Smartphones; iPadÂ®: 13% for iPadÂ® 1, 2 and 3; 30% for iPadÂ® Mini; 100% for iPodÂ® and Digital Music Players. CE and FCC approved. Battery U.S Patent No. ZL 201330502974.6. Disco Lights Bluetooth Speaker & Econo Mobile Charger set. Includes the Disco Lights BluetoothÂ® Speaker and the Econo Mobile Charger. Speaker has an aluminum case cylinder with steel mesh cover and no-slip bottom. 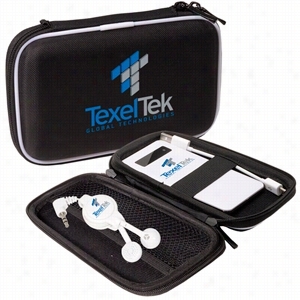 Connects to your mobile device using wireless BluetoothÂ® technology or through the 3.5mm audio cable provided. Push button to answer phone calls. Speak hands-free into built-in microphone. Also play MP3 files though a USB flash drive or TF card. Includes rechargeable Lithium-ion battery that charges through USB port (cable provided). Rated Impedance: 4 Ohm; Rated Power: 3w; Speaker: 1.6 inches; Rated Voltage: DC 5V; Aux in: 3.5mm audio jack; Frequency response: 280HZ-16KHz; SNR: = 95d; Sensitivity: 80db Â± 2db; Distortion: = 0.3%. Battery is a portable Samsung Lithium-ion cell in ABS plastic shell allows you to charge your devices virtually anywhere. Power bank includes standard USB connector cable to charge battery from your computer or any USB port with a power supply. Input: 5V DC; Capacity: 2200mAh; Output: 1000mA. Lifespan: Up to 500 charges. Charging capacity: 100% for iPhoneÂ® & Smartphones; iPadÂ®: 15% for iPadÂ® 1, 2 and 3 - 20% for iPadÂ® Mini; 100% for iPodÂ® and Digital Music Players. CE and FCC approved.